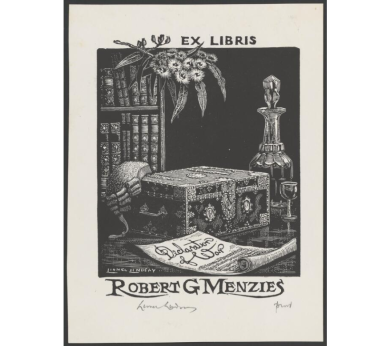 The Robert Menzies Collection at the University of Melbourne comprises around 3800 books from the personal library of Sir Robert Gordon Menzies. There are also photograph albums documenting Menzies’ trips to India, the Netherlands, Greece, West Germany, the Philippines, Malta, Japan and Indonesia, as well as the Royal Visit of 1954. The collection includes a set of notebooks from Menzies’ time as a student and young barrister. The collection contains books, photographs, manuscript material (mainly student and barrister notebooks, but also some other manuscript material kept inside books), ephemera and objects (e.g. Menzies’ honorary Doctor of Laws from Harvard University). Robert Menzies entering the Taj Mahal. Robert Menzies being introduced to members of the diplomatic community in Indonesia. Morning coffee for Pattie Menzies hosted by Mrs Djuanda in Indonesia. Robert Menzies inspecting a guard of honour in Malta. Queen Elizabeth II at the Shrine of Remembrance, Melbourne. Robert Menzies in Syntagma Square in Athens. Smoking man seated behind Robert Menzies in West Germany. Robert Menzies at the Taj Mahal. Robert Menzies and group at the Parthenon.